Invelos Forums: Biting of more than I can chew? Biting of more than I can chew? Sometimes a simple idea gets out of hand, just because I start thinking "Wouldn't it be neat if it could also ..." and then one thing leads to another. The program I'm working on right now is a case in point. - Might be good to be able to specify the time to run the export. - Oh wait, it would be good to run a backup while I sleep, too. - But I don't want to run backups every night, do I? - Let's make it Run every n days/weeks/months. Why limit myself? - Oh, upload collection to my online collection. - Refresh profiles? Well, that would only work if I accept all updates. That's a no go. - Actually, I should be able to run any Profiler command file that I have created. - Run any program? That could be done by the regular Windows scheduler, but why not? So then comes the next flash of inspiration. One might want to run several things in succession. Sure, that could be done by scheduling several tasks just a few minutes apart. But that's error prone, especially if you need to change it to another time. I know - I could group tasks together in an event, and just schedule the event, not the individual tasks. So that's one scheduler containing one or more events, and each event containing one or more tasks. - I could start DVD Profiler if it is not already running. - I could exit Profiler when the event is complete. - Hm, I might need to pause a while after some tasks, like starting Profiler, just to make sure things are ready. - And there are most likely some things that could be done that I haven't considered, so let's set up a custom field where one can enter AutoIt keystrokes. Sigh! The "couple of hours" project just escalated into God knows how many hours. And at this point the dreaded thought pops into my head "Can I even do this?" Yeah, dreaded, because once that thought has been thought, the only answer is "I won't know until I try"
And there is no escape after that. So, will this project ever come to fruition? Only time will tell. There are around 700 unwatched movies in my collection competing for my time. In the meantime, here is a screenshot from my Visual Studio showing the current design for the task editor. Only some of the fields would be shown at any one time, depending on which task type was selected. Is this whole project a good idea or a massive waste of time? Feel free to let me know. Most people don't exploit the power and utility of the MS Scheduler within windows. Personally, I use it to keep synchronized backups across two servers. So, I know such a tool would be helpful, and way beyond DVD Profiler tasks. That's my humble opinion. Does your program actually use the MS Scheduler, or provide its own services? There are probably pros and cons to using the built-in facility, but there is an API that might make the coding simpler. For one of my other tools, I used code snippets from MS "CSTaskScheduler" sample application. Just FYI in case it would help you. Your GUI looks way nicer of course, but some of the plumbing in that sample might be helpful. It was for me. I usually start my projects by designing the user interface, with just a general idea of how to implement the code behind it. Right now I'm still into the GUI phase, so I haven't given too much thought about how to implement the scheduler. I was expecting to have to write my own. I hadn't really considered that there might be an API. Now that I know, I shall certainly look into it. Many thanks for pointing it out to me. Another little tidbit, this time how the main window can look with two events configured. They contain no tasks. Adding tasks to events is not implemented yet. Neither is the actual scheduling, or the running of tasks. Lots of things to do still - if I don't get bored and give up. Got 3 greenies for my original post. That's nice, but unfortunately I don't know if they mean that that idea is good, or just that the post was entertaining. I guess I'll have to assume the latter. Don't be shy! Well my comments were genuine. The MS interface to the scheduler is horrible. That's probably why most people don't use it, even those of us that know about it. The other perspective I have is selfish. If you do this, I can scratch two "plugins in planning" off my list. One you know about, XMLSpy. The other has been on my list for a long time, but never got much further - an "OnEvent" mechanism inside DVDP. Basically it would be a way to do things based on triggers, including time. If you make your tool, there probably wouldn't be enough additional value to either of those planned plugins, so it would save me tons of time and grief. 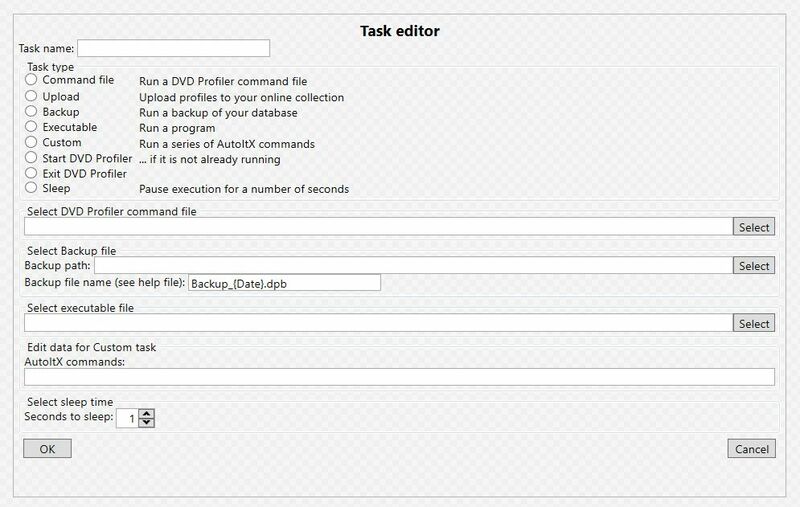 Now if there were a way to send DVDP a command directly, without using virtual keystrokes such as AutoIT ... stay tuned. It is in testing. I've learned my lesson. Won't even release a Beta until it has been thoroughly tested, and this one has no GUI. Now if there were a way to send DVDP a command directly, without using virtual keystrokes such as AutoIT ... stay tuned. It is in testing. Well, that sounds really interesting! My plan for DvdpScheduler is to use AutoIt and command files. But I would do away with that and update my program in a heartbeat if I could send commands directly. Of course, there is still no guarantee that I'll finish DvdpScheduler. There may be obstacles that I am not sure that I can overcome. We'll see. I think we should both proceed with our plans independently, with no guarantees. But it is always helpful to have hints of future plans to avoid too much overlap, so in return for your sharing, I did a bit of my own. I'll keep an eye out for your progress, and if something useful and stable emerges from my testing, you'll be the first to know! This sounds just like me with my Foster Kitten Cam. I've went from one pc with one cam, to one pc with two cams, to one pc with a bazillion cams to two pc's with 1 cam each to 4 pc's with 1 cam each to adding Stream Decks to each PC so I can control what happens outside the foster room with single key presses (such as mute/unmute/display cam unavailable/etc). Now I'm looking into having all the 4 Brio web cams connected to one PC and cams 2-4's stream sent over the network via NDI to the different NUC PC's to see if it offloads some of the work to the beefier main PC (which I'll be upgrading to a 16 core Threadripper). Add one having a PC that'll take the NDI video output of all the cams to create a quad cam to show all 4 camera angles at once. Haven't thought past that point yet. I have looked into this and there are some possibilities. TRIGGERMENUITEM This can be used to trigger any of the builtin Profiler menu items. I will possibly get onto looking into these over Xmas, as too much on at work. What time I have had to work on things, I have now got all my plugins working / compiling under XE10.2 Tokyo. While combing through the Plugininterface file for Pascal I have found heaps of gems, like searching the online DB, and the ability to interface with Custom Data. Just had an idea, you could have a 'sidebar' that has all your commonly used menus at your finger tips. Sounds good. Let's get some more cool plugins from another author! I won't do any work on my "OnEvent" idea. BTW, Custom Data is some tricky business, but powerful. You might want to scan the threads in the developer forum of a few years back when a couple of us were slogging thru testing of our plugins and the API. Most of the "gotchcas" are mentioned in there, but feel free to post any questions in that forum once you get going. You can also get some good clues from examining the XML, filters and HTML sections produced by my SideCar plugin and several by DJ Doena (Enhanced Titles, etc). Sounds good. Let's get some more cool plugins from another author! DvdpScheduler is ready for inhouse testing. It may need some spit and polish, but but basically it seems to be doing what I intended it to do, knock on wood. If anyone is curious about it, you can download the preliminary help file. I'll post a thread in the Plugins forum if and when I think it's fit for public consumption.